In my family, growing up, the men played Pinochle and the women played Mahjong. Later in life, this became a source of vexation to me, because the men so clearly got the short end of the stick. First of all, to play Pinochle you have to use a stupid Pinochle deck, which isn’t any use whatsoever when playing War or Go Fish or other card games that normal people play. Secondly, there was some sort of unwritten law that said that in order to play Pinochle, you have to have at least one guy smoking a really stinky cigar, which is gross. Lastly, if you’re playing Pinochle instead of Mahjong, then you don’t get to play with the cool, clicky tiles that you can use to build pretend igloos if you tire of the game. Verbally, the games were about a wash, each with its own special brand of nonsense words (“meld” and “trump” versus “chow” and “pong”). The simplest way to describe the game is “Gin, with tiles.” A summary of the rules – and I’m omitting many details for brevity – is as follows. Each player’s hand has fourteen tiles (more can be accrued during play). The Mahjong tileset consists of three “suits” (circles, bamboo, characters) with tiles numbered 1 through 9; there are four of each numbered suit tile, four dragons of three colors, and four of the four winds (East, North, West, and South). The goal is to compose a hand that consists of four “tricks” and a pair. A trick can be a numerical sequence of three tiles in one suit (a “chow”), three of any tile (a “pong”), or four of any tile (a “kong”). Tricks can be hidden in your hand or, if created by picking up someone else’s discard, exposed. You can pick up a discard to complete a pong or a kong from any player. You can only pick up a discard to complete a chow if it was thrown by the player sitting to your left. You can pick up a discard from any player if it completes your hand (at which point it is considered proper etiquette to shout “Mahjong! In your face!” and do an amusing little dance involving pelvic thrusts. This dates from the Qing dynasty.). Most of the complications in Chinese Mahjong come during the scoring phase, where there are many complex rules to determine how many “points” the winning hand was worth, which translates directly into how much cash everyone else has to pay you. The biggest problem with Mahjong is that if you’re not a Jewish grandmother or Asian, there aren’t many people you can play with, in person. So that means you’ll want to either play other people online or play against the computer. Or browbeat your friends into learning to play, but that’s beyond the scope of this article. Which brings us to the present day, wherein if you google for “Mahjong computer game,” you will get approximately 8 billion hits for “solitaire mahjongg”. This game, which I believe was made popular by the game “Shanghai,” has absolutely nothing to do with Mahjong except that it uses the tiles. It is a variant of Concentration, where you match tiles, except the tiles are visible – let’s call it “concentration for really, really stupid people.” The only analogy I can come up with is that it’s like people developing games called “poker” that involved building houses of cards with Poker decks. There are, and I assure you I do not exaggerate, hundreds upon hundreds of these “solitaire mahjongg” games. There are so few true Mahjong games that you can enumerate them. Q. - Will there ever be a version for the Mac? If you are on a Mac, you’re out of luck unless you’re able and willing to run in Classic or Java. There are a bunch of Classic applications, none of which are superb. The best of the lot is probably Mahjong Parlor, which amusingly lets you set the tile voice calls to English, Cantonese, French, or Spanish. Because the thought of being without Mahjong on my Mac is mortifying, I am working on an OS X native Mahjong app in my ample spare time. It should be done by about September, 2016. There’s also SmartMahjong, a Java application that runs on OS X as well as Windows. It lacks the polish of a native app and hasn’t been updated in quite a while. And it wants to be run as root, which means I have to press two buttons to get it to work, which means I hardly ever do it. If you lose, Creepy Girl will eat your brain. Your best bet on the Mac is probably to play one of the online variants. I like the Yahoo! applet (see link below). It’s not at all attractive, but it does a good job of clearly communicating what’s going on at all times. 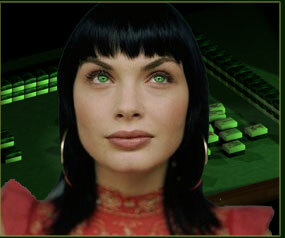 The best looking online variant is the Java applet at Jade Dragon Mahjong. If you can get past the creepy looking chicks on the homepage and the overall sleazy Taiwanese gambling house aura, the applet is fairly attractive, if slow. Mahjong can seem intimidating because of the number of tiles, and the scoring rules, but just remember this simple fact: If you can play Gin Rummy, you can play Mahjong. So the next time you encounter yet another uninspired reimplementation of Shanghai, why not spend some time playing real Mahjong instead? You’ll be glad you did. If you’d like to play true Mahjong on your computer, this list of true Mahjong computer games is the first and most important resource to use. The Yahoo! Games in-browser Java applet is pretty good. The Internet Mahjong Server works too, but I found the (native) interface even uglier than Yahoo’s. If you want to play the really wrong kind of Mahjong on your mac, this list of stupid “solitaire” Mahjong style games should help. For Mac or Windows. On the Mac, at least, I’d say my favorite game of this kind is Aki. I’ve been kind of cruel to “Solitaire Mahjong” in this article, even though it is actually an interesting game in its own right. I think the reason it gets under my skin so badly is the breathless descriptions of it being from antiquity, a prime example of Orientalizing something in the name of profit. Really, the game was invented by an American in 1981. Here’s a fair summary of the Chinese Mahjong rules, although it leaves out discussion of the flowers, which impacts scoring. One of the nicest things about playing Mahjong in real life is enjoying the texture and sounds of the tiles. The Mahjong Museum has many nice photos of different sets made from different materials. As always, Wikipedia has a good general reference article on the game. Lastly, the Sloperama Mahjong FAQ is simply superb from top to bottom. I especially enjoy their selection of antique books on the game (this one is particularly brilliant, make sure you get past the intro), and their detailed section on determining what your Mahjong tiles are made of.